I realize it’s customary for food cravings to strike when you miss a particular dish, when you haven’t had the chance to taste a favorite thing for a long time, and when you can’t wait for the next opportunity to have whatever that is once again. However, even though I live smack in the middle of Austin where you can’t take too many steps in a row without tripping over another Tex-Mex restaurant, I constantly crave Tex-Mex food. I can order tacos for breakfast, burritos for lunch, and enchiladas for dinner by traveling a few blocks from home in any direction whenever I want, but sometimes, home-cooked Tex-Mex is the way to go. Our favorite spots do get crowded causing long waits for a table at peak times, and besides, by making my own enchiladas, I can do things like add some sauteed CSA Swiss chard and top them with sliced, fresh jalapenos for even more heat. These Sour Cream Chicken Enchiladas are found in The Homesick Texan Cookbook as well as on the website, and this tangy sauce is one I’ll now be making often. The sauce is quick to make, and it starts like a veloute with a serrano chile-spiced roux to which chicken broth is added. 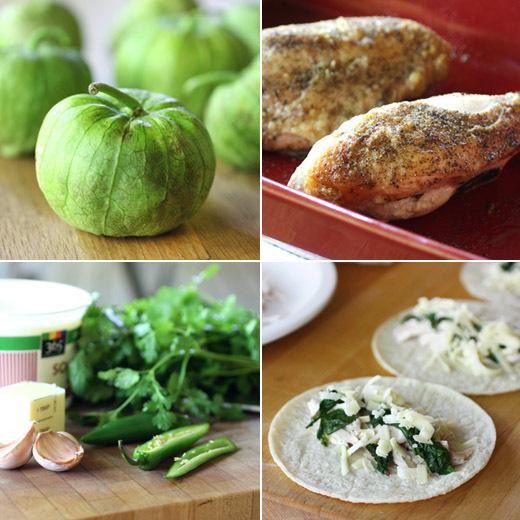 Sour cream and roasted tomatillos are blended in to finish. It thickens as it bakes with the chicken- and cheese-filled enchiladas and makes you happy you’ll have some leftovers, which is another advantage of cooking at home. The recipe includes instructions for cooking chicken breasts for the enchiladas, but any cooked and shredded chicken will work here. With your chicken ready and some Monterey Jack cheese shredded, it’s time to make sauce. To start, I broiled a pound of cleaned tomatillos until well-browned on all sides, and transferred them to the blender. Then, butter was melted in a saucepan, and diced serrano chiles were added followed by minced garlic. Flour was whisked in to make a roux, and then chicken broth was slowly added while whisking. It was cooked until thickened, and I added sour cream, cumin, cayenne, and chopped, fresh cilantro off the heat. The sour cream mixture was poured into the blender with the tomatillos, but it was a little too much for my blender pitcher. I ended up pureeing in two batches. With the sauce completed, you can begin assembly of the enchiladas. I set up a row of warmed corn tortillas and started topping them with the fillings. A little shredded chicken was placed on each, followed by shredded cheese, and in my case sauteed Swiss chard. I skipped the suggested chopped onion because I tend to skip onions most of the time. With all the fillings in place, you just roll each tortilla into a cylinder. A cup of the sour cream sauce is poured into an oiled baking dish, and the filled tortillas are placed seam side down in the sauce. When all the enchiladas are in the pan, the remaining sauce is poured over top, the remaining cheese is sprinkled over it, and the dish is baked for 25 minutes. I gave it a few minutes under the broiler to brown the cheese at the end of the baking time. Not all of my food cravings are this crazy. Of course, I crave fresh, ripe tomatoes when there are none to be had in the winter, and I even start to long for dark, leafy greens when they just don’t grow here in the heat of summer. But, I don’t think a day will ever come when I won't crave a Tex-Mex meal either from a restaurant or home-cooked. This is a recipe that we just love!!! Wouldnt change anything about it.. We need to try it out and we will get back to you. That is one scrumptious looking and sounding dish! A perfect combination. I love Swiss Chard. It's a beautiful addition to this dish! 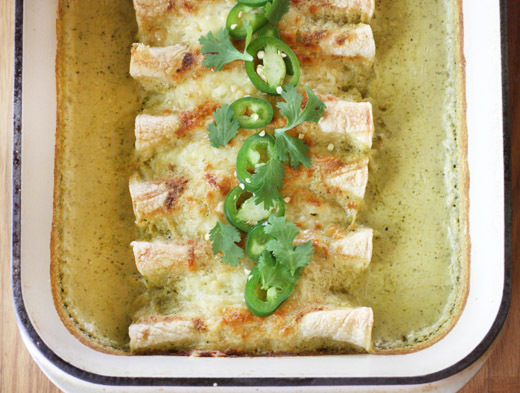 I've only cooked enchiladas a couple of times but never with a green sour cream sauce. Definitely need to try this variation! Thanks! I find myself craving mexican food lately. There is an excellent place in Rona, a strange place to find authentic Mexican in a hardware store, but just the best when have a craving. Yum!! These look lovely n creamy and so tempting! Oh my Lisa, I can barely look at your photos this morning... those enchiladas look SO good! And I'm with you, I crave tex (or cal)- mex all the time, and so does my family. How can we resist. This looks so tempting and scrumptious! The sauce just pulls everything together and makes it look so complete. By the way, I am always looking for ripe fresh tomatoes throughout the year , even in winter too! Lisa, I just must cook this recipe! Your sauce is grat. I like Swiss Chard and each meal containing it. This looks incredible, especially the sauce! I will try this soon for sure. this is embarrassing to admit - but i've never had an enchilada before! yours looks and sounds absolutely wonderful - i've really really gotta try this! Hi Lisa, these sure look good. I made a Rick Bayless recipe for Swiss Chard Tacos and loved every bite. Next time I make Chicken Enchiladas, I'll most certainly add some Swiss Chard. Really nice photos as always. Awesome take on a classic! 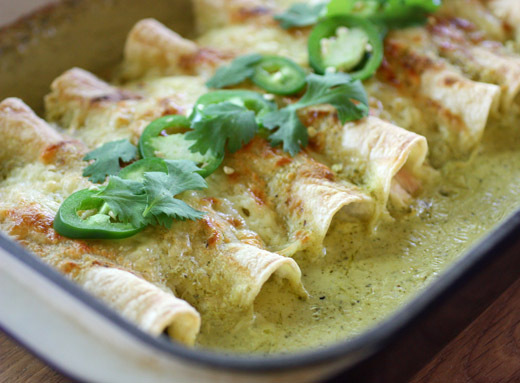 i'm a big fan of creamy enchiladas, and the swiss chard is just a fantastic touch! This looks so tempting! Enchiladas with sour cream is a brilliant idea! These are just beautiful, Lisa! It is very easy to crave Mexican food. There's something about the spice combinations and all that cheese. I don't ever tire of tex-mex either so I totally get what you mean! The flavors just never seem to fail to entice me! Loving the sound of the green sauce for this!